Due to the immense volume of blended coffee PrairieFire sells, we purchase numerous varieties of origin coffee by the truck load (37,500 pounds). Pictured here is our supply of 100% extra prime washed Mexican UVVW processed decaffeinated coffee. Almost all green coffee beans are packaged and shipped in burlap bags, weighting 135 pounds or 150 pounds per bag depending on the coffee producer. Many of our specialty coffees are bought in quantities of 2 to 10 bags at a time, depending on the volume of demand. We us a platform that allows us to stack numerous types of origin coffee around it, so that a person can easily access the different types of coffee used in each of our blends. The green coffee beans are poured into a special bin which augers the coffee beans into a shaker and cleaner, which removes any foreign debris, then the green coffee goes into holding bin above the roaster. The roasting process is started by turning the inner drum of the roaster on, then the green coffee beans are poured into the roaster and the rotating drum actually continues mixing the different types of coffee beans together. The period of time to roast coffee beans is generally 15 to 20 minutes and will vary depending on the ambient temperature, air flow, the moisture content of the coffee beans and the type of roast (light roast, dark roast, French roast, espresso and etc). 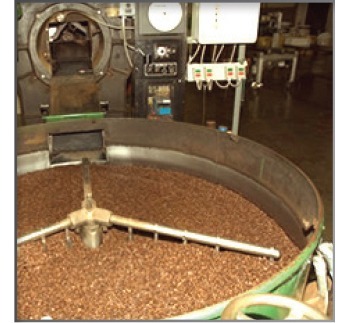 A small sample of the coffee beans are removed and the color of the beans are checked against a standard roast profile (a color, set by the specialty coffee association of America) prior to ending the process of flame roasting. Once the flame goes out, a small amount of water is sprayed over the roasted beans within the roaster to put out any cinders and the inner drum of the roaster continues to turn the coffee beans until the roasted coffee is removed. Now with the roast cycle completed, the coffee beans are poured in a cooling bin directly from the roaster. The cooling bin has a stirrer in the middle of the bin which has three arms and each arm has five fingers going down to almost the bottom of the cooling bin which rotates continually to stir the hot coffee beans. The bottom of the cooling bin is flat, with many small holes in it, which allows a powerful fan to draw air down through the coffee beans to help cool them. Once the roasted coffee beans are cooled, they are moved into large bins above coffee grinders and allowed to de-gas overnight before being ground. After a specialty origin coffee is roasted it is ground to exact specifications and a variety of origin coffee and flavored coffee are packaged in one pot packages. The package machine shown here automatically measures the exact amount of coffee for each package, forms the packaging film, them fills and seals each package. This type of equipment can produce approximately 50 packages of coffee per minute. Once the coffee is packaged PrairieFire will deliver or ship the finished product.